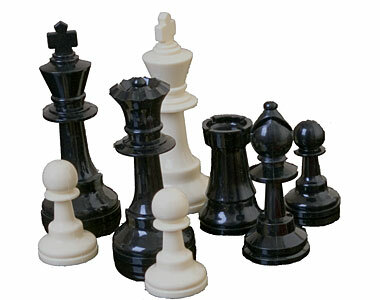 These Chess Pieces are made of durable, long lasting plastic molded in the Classic Staunton Design. Black and Ivory pieces are available. Miscellaneous # 1293 Staunton Plastic Chess Pieces have a 3-3/4" tall King. These Closeout Chess Pieces are available per lot of 100 miscellaneous pieces (specific pieces are not available). Please Note: Only miscellaneous/random pieces are available. Complete sets are not available.